The University of Hyderabad’s (UoH’s) “decision” to revoke the suspension of four Dalit students following country-wide protests against the suicide of their colleague and leader, Rohith Vemula, a 26-year-old research scholar, has been rejected -- because it allegedly comes with huge “ifs” and “buts”. Close on the heels of the UoH Executive Council announcement, the Joint Action Committee for Social Justice of the UoH has questioned the its “legitimacy”. The Executive Council, said the Committee in a statement, met “without attending to the protesting students who are on indefinite hunger strike”, that too “not inside the campus”. Worse, it added, the Executive Council issued a circular, not an order revoking the suspension. “We outrightly reject this illegitimate circular since it came through a committee headed by vice-chancellor Prof Appa Rao Podile, who in our opinion is not the legitimate vice-chancellor anymore but in fact a criminal on the run”, the statement said. The statement particularly took objection to the wordings of the circular, which said that the punishment was being terminated in the circumstances of "extraordinary situation". 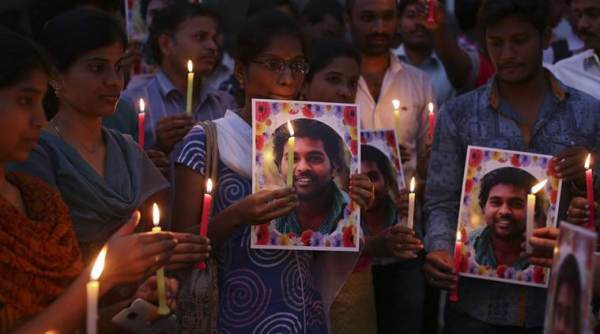 “This led to the suspension, social boycott, and eventually the death of Rohith Vemula, while the University of Hyderabad administration is responsible for the mishap. It is shameful that our democratic protest for social justice is termed as an extraordinary situation”, the statement said. Pointing out that the vice-chancellor and the MHRD have been giving us an excuse that “the case is in the court”, the statement says, “more than 72 hours” have elapsed after the FIR was filed against Union minister Bandaru Dattatreya, whose letter against the Dalit students “anti-national activities” triggered the suicide. Also, the statement said, no action has been taken against other culprits, including the vice chancellor and ABVP president Susheel Kumar, on whose complaint the Union minister acted. Telangana police is “not arresting the culprits, who are booked under the 5C/ST Prevention of Atrocities Act and for the abetment of suicide”.